Carnival Hat Chest(M) A new look for your characters with an amazing stats. 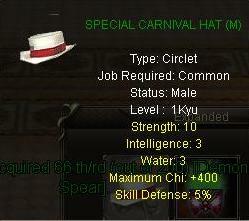 On opening the chest you might get a Carnival Hat(M) or if you are lucky you will get a Carnival Special Hat(M). The difference betwen Normal and Special are a matter of +10 Strength. Note : Monk characters can use this item but will not be visible, only the stats are added. Right Click to open the Chest. 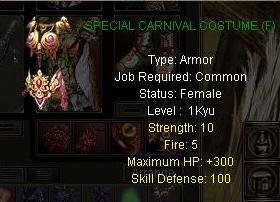 Carnival Costume Chest(M) A new look for your characters with an amazing stats. 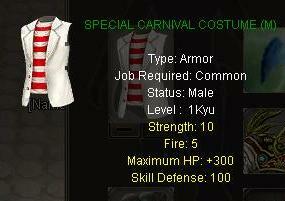 On opening the chest you might get a Carnival Costume(M) or if you are lucky you will get a Carnival Special Costume(M). The difference betwen Normal and Special are a matter of +10 Strength. Note : Monk characters can use this item but will not be visible, only the stats are added. Carnival Foot Chest(M) A new look for your characters with an amazing stats. 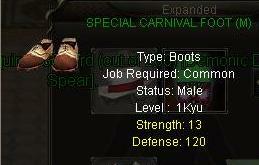 On opening the chest you might get a Carnival Foot(M) or if you are lucky you will get a Carnival Special Foot(M). The difference betwen Normal and Special are a matter of +10 Strength. Note : Monk characters can use this item but will not be visible, only the stats are added. Carnival Hat Chest(F) A new look for your characters with an amazing stats. 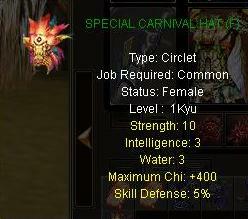 On opening the chest you might get a Carnival Hat(F) or if you are lucky you will get a Carnival Special Hat(F). The difference betwen Normal and Special are a matter of +10 Strength. Note : Monk characters can use this item but will not be visible, only the stats are added. Carnival Costume Chest(F) A new look for your characters with an amazing stats. On opening the chest you might get a Carnival Costume(F) or if you are lucky you will get a Carnival Special Costume(F). The difference betwen Normal and Special are a matter of +10 Strength. Note : Monk characters can use this item but will not be visible, only the stats are added. Carnival Foot Chest(F) A new look for your characters with an amazing stats. 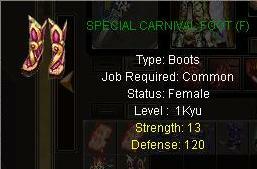 On opening the chest you might get a Carnival Foot(F) or if you are lucky you will get a Carnival Special Foot(F). The difference betwen Normal and Special are a matter of +10 Strength. Note : Monk characters can use this item but will not be visible, only the stats are added. Potion healing potential(18000) - 3500pts This item will be a limited edition for the event period of the Hunting Aid System from 15th June - 21st June 2011. Energy is used to utilize the Hunting Aid System(F5). Right Click the item after purchasing to add energy to your character. To check the energy level please click (C) Character Selection Window and look out for the Energy Amount. Potion healing potential(3600) - 1000pts This item will be a limited edition for the event period of the Hunting Aid System from 15th June - 21st June 2011. Energy is used to utilize the Hunting Aid System(F5). Mystery of the Box - 9900 pts. The player who has "Right to Relocate Enhancement" can get to right to move his enhanced option to each his item for one time only. Ex) Weapon -> Weapon (O) / Armor -> Weapon (X) Lucky Box makes you get perfect Right to Relocate Enhancement with lower probability. Click the right button on the mouse to use. Holes Planting Amplification - 15000 pts. The enhancer of amplification makes the result of holes planting socket added +1. It is used when making holes planting. Holes Planting Sublimation - 20000 pts. The mysterious stone of sublimation makes holes planting returned to the previous state when it makes socket. It is used when returning holes planting. Secret Herb of Growth 7900 pts "Be readly for the Darkness Patch and level up your characters. This item gives an additional exp of 250% for players to enter Divine rapidly. Can be used for 600 mins. Note: Can only be used from Lvl1 - Lvl100." Right Click the item to activate it and right click again to deactivate when not grinding. Secret herb of Growth(Divine) 7900 pts "Be readly for the Darkness Patch and level up your characters. This item gives an additional exp of 150%. Can be used for 600 mins. Note: Can only be used only by Divine Players." Talisman Chest (5EA) 9200 pts Opening this chest a player will get a Orb, Tablet, Stone, Charm or a grade Armor Set Strengthen item. Right Click the Chest to obtain the items. Blessed Catalyst (45%) 10000 pts This is a wonderful Charm used to obtain success. This item is used for Advanced Fusion in the blacksmith to craft 2nd accessories. Blessed Catalyst 45% is way better than the charm of Luck when crafting 2nd accessories. Use this Blessed Catalyst 45% in the advanced Fusion option at the Blacksmith. Superior Sky Dragon Scale - 40000 pts. "The Scale of Superior Sky Dragon Scale. It prevents item from vanishing ,when upgrading failure on Weapons and Armors. When it fails to strengthen there is no level degarding when using this Superior Sky dragon scale ." "It can be used when strengthening items. 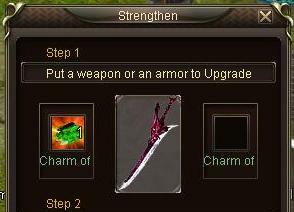 Insert the item in the ""Tool"" section in the Strengthen(Upgrade) window. Treasure Chest - 8800 pts. Surprise chest you may obtain any one of item from this chest randomly. Book of Mysterious Skill ,Armor Material of Kunlun Chest ,Charm of Luck 2x Effect ,Charm of Luck 3x Effect ,Charm of Luck 4x Effect ,Tablet of Alteration ,Hydrangea Chest (Armor),Hydrangea Chest (Weapon) ,Yama's Heavenly Flower Accessory Chest ,Phantom Beast, Book of Forms Corrupt Monk (lv3),Mystic Water pot of Luck ,Blessing of Hero Chest lvl3,Blessing of Hunter Chest lvl3,Blessing of Sage Chest lvl3,Divine Dragon Shield Chest lvl3 ,Eyeball of Green Dragon ,Chest of the Blacksmith ,Trinketry Talisman Chest (5EA) ,Power stone (Rare item used for crafting Sinister items). Try your luck!!!! Right click on the Chest to open and you may obtain a random item from the above list of items. Special Pendent of Sack 2900 pts. "These sacks contains the pendants that are equal to Precious pendant but they differ in their stats, you may get any of the following special pendents from the sack, Special Pendent AT Chest (+1 ~ +3), Special Pendent AD Chest (+1 ~ +3), Special Pendent SD Chest (+1 ~ +3), Special Pendent HK Chest (+1 ~ +3) ." Right click the sack to open the chest which may yield any one of the Special pendants randomly. These pendants may be used under the Blacksmiths strengthening section to add the stats on to your Hero tavern costumes.The above are few of the item that may be obtained from Special pendents sack and there item properties. Event Guardian gift Package IV 26500 pts On opening this package you will get a Sacred Guardian(30 days), Pomegranate Holy Water & a Jade Holy Water. Right Click on the package to open. Mystrious Skill of Chest 9900 pts You will obtain a random item of Seal transend Power (1~4), Seal Transend Defense (1~4) or Seal Invincible (1~4). Right Click the Chest to obtain an item.